Control of money supply – Monetarists argue there is a close link between the money supply and inflation, therefore controlling money supply can control inflation. Supply-side policies – policies to increase competitiveness and efficiency of the economy, putting downward pressure on long-term costs. Fiscal policy – a higher rate of income tax could reduce spending and inflationary pressures. Wage controls. Trying to control wages could, in theory, help to reduce inflationary pressures. However, apart from the 1970s, rarely used. In a period of rapid economic growth, demand in the economy could be growing faster than its capacity can grow to meet it. This leads to inflationary pressures as firms respond to shortages by putting up the price. We can term this demand-pull inflation. Therefore, reducing the growth of aggregate demand (AD) should reduce inflationary pressures. Increasing incentive for exporters to cut costs. 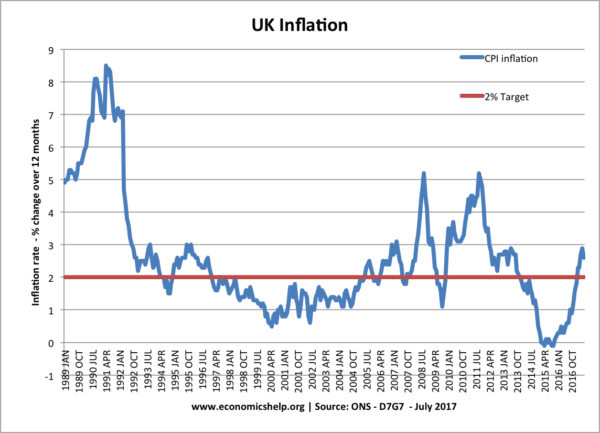 UK inflation target set in 1998. As part of monetary policy, many countries have an inflation target (e.g. UK inflation target of 2%). The argument is that if people believe the inflation target is credible, then it will help to lower inflation expectations. If inflation expectations are low, it becomes easier to control inflation. Countries have also made Central Bank independent in setting monetary policy. The argument is that an independent Central Bank will be free from political pressures to set low-interest rates before an election. The government can increase taxes (such as income tax and VAT) and cut spending. This improves the budget situation and helps to reduce demand in the economy. Both these policies reduce inflation by reducing the growth of Aggregate Demand. If economic growth is rapid, reducing growth of AD can reduce inflationary pressures without causing a recession. If a country had high inflation and negative growth, then reducing aggregate demand would be more unpalatable as reducing inflation would lead to lower output and higher unemployment. They could still reduce inflation, but, it would be much more damaging to the economy. If inflation is caused by wage inflation (e.g. powerful unions bargaining for higher real wages), then limiting wage growth can help to moderate inflation. Lower wage growth helps to reduce cost-push inflation and helps to moderate demand-pull inflation. However, as the UK discovered in the 1970s, it can be difficult to control inflation through incomes policies, especially if the unions are powerful. However, in practice, the link between money supply and inflation is less strong. Often inflation is caused by persistent uncompetitiveness and rising costs. Supply-side policies may enable the economy to become more competitive and help to moderate inflationary pressures. For example, more flexible labour markets may help reduce inflationary pressure. However, supply side policies can take a long time, and cannot deal with inflation caused by rising demand. In a period of hyperinflation, conventional policies may be unsuitable. Expectations of future inflation may be hard to change. When people have lost confidence in a currency, it may be necessary to introduce a new currency or use another like the dollar (e.g. Zimbabwe hyperinflation). Cost-push inflation (e.g. rising oil prices can lead to inflation and lower growth. This is the worst of both worlds and is more difficult to control without leading to lower growth.